Buried treasure in Nebraska do exist. Nebraska hidden treasure is mostly the outlaw type. Back in the days of the old west it was common to hear or read about outlaws robbing a bank or a stagecoach. Then while on the run from the local sheriff, they would often times bury their loot, and return at a later date to retrieve it. Sometimes the bad guys were caught and hung without revealing where their cache was buried. I know individuals who have located a few of these lost treasures. However, without the proper research into these stories, or any lost treasure story, your chances of finding one are not very good. The information here is a good start for your treasure hunting search. But you may want to research the stories further. Using the Internet, and visiting the local historical societies of the areas the stories revolve around is a great way to research. I use these methods all the time. Having a metal detector is also a good idea. 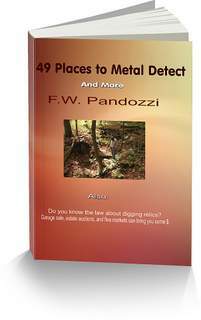 If you do not own a metal detector, but your thinking of purchasing one, don’t spend a lot of money. The detectors that cost between $350 to $450 is all you need. The higher end models with all of the bells and whistles are for the more advanced treasure hunter. Believe me, you can find hidden treasure with a less expensive model. I’ve been treasure hunting for thirty-five years and the detector I use now, I purchased new a few years ago for $425. For more information on where and how to research for lost treasures, please visit my page here. Good luck! And have fun in your search for buried treasure in Nebraska. The outlaw Jesse James supposedly buried treasure on the Catron Miyoshi Fruit Farm. The farm was located approximately three miles southeast of Nebraska City. A 1930‘s bootlegger, may have buried approximately $10,000 in gold coins, and $25,000 in paper currency, near the Plattsmouth Bridge. Quantrill‘s Raiders, raided the residents of Bloomington during the Civil War. But prior to the raid many of the residents buried their valuables. Many of the residents were killed, and their valuables have never been recovered. Dobytown, is known to hold many buried treasures. The treasures were hidden by soldiers and gamblers during the Civil War era. Buffalo Bill Cody, buried approximately $17,000 in gold coins near the Scotts Rest Ranch, located near North Platte. Anytime you are going on to private property be sure to ask for permission. If you are venturing on to State or Federal lands you should know the laws of that State. Buried treasure in Nebraska may be located in ghost towns.